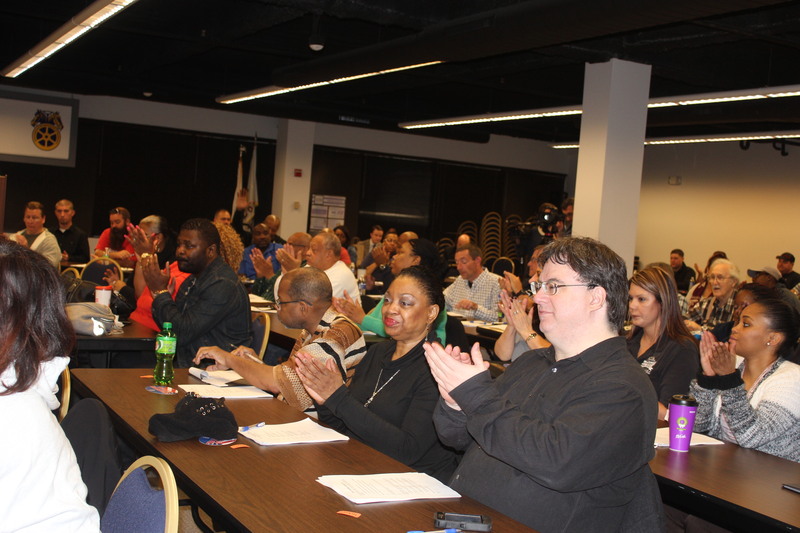 Teamsters Local 700 proudly hosted more than 100 union stewards at the Local 700 meeting hall for a training seminar that was held on Tuesday, Nov. 17 and Wednesday, Nov. 18. Local 700 hosts trainings throughout the year for stewards to strengthen their knowledge of union policies and procedures. Secretary-Treasurer Michael G. Melone formally welcomed the group, thanking the stewards for their commitment to the union. “What you do as stewards is fundamental in keeping the membership connected to the union and we can’t thank you enough for everything that you do,” said Melone. Senior Staff Attorney Cass Casper kicked off the presentations with a review on Elements of Discipline, highlighting the importance of filing grievances correctly and gave attendees a detailed layout of steps to follow. Labor attorneys Stuart Davidson and Drew Gniewek of the Willig, Williams and Davidson law firm delivered interactive presentations that covered topics including harassment, social media, the Family Medical Leave Act and the Americans With Disabilities Act. Stewards who attended the training gained ideas to take back to their respective workplaces regarding these issues. All training participants received a Local 700 Steward polo shirt and shared a meal with their fellow stewards.